Just When You Thought It Couldn't Get Any Crazier....Along Comes Camden's Looney Council. The highly controversial plan to ban cars and cabs from Tottenham Court Road has led to a major protest from taxi drivers this week. But, just when you thought it couldn't get any crazier along come the Lycra clad planners from Camden who have now announced that not only will Tottenham Court Road be Buses and cycles only....they are also going to put a new cycle lanes along the two way Gower street where all the other traffic will be squeezed into.....a sort of Victoria Embankment, part two. The plans – due to be introduced in March – are part of a radical revamp that will see Tottenham Court Road and Gower Street turned into two-way routes with vehicles banned between 8am and 7pm. 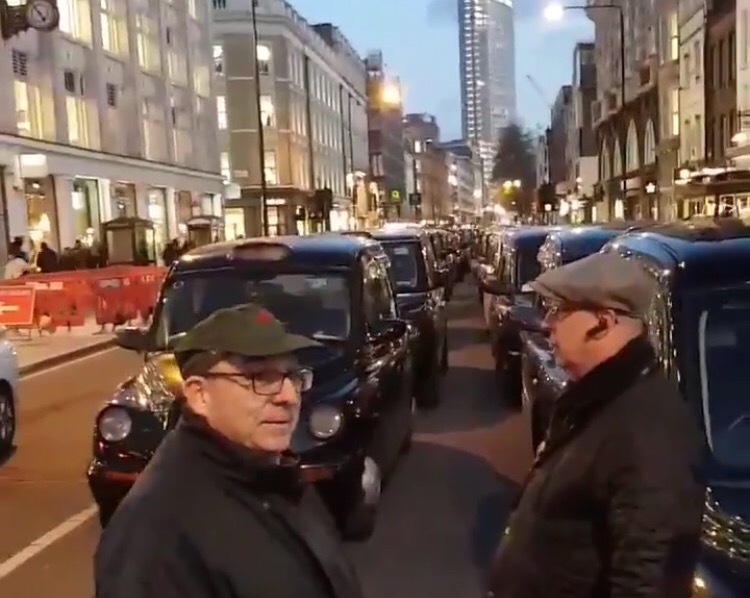 The protests, organised by the Independent Taxi Alliance (ITA), saw drivers parked their black cabs on the road, blocking traffic heading north to Euston Road, leaving a third lane free and clear for emergency vehicles. The drivers, along with residents and business owners, are calling on the Town Hall to lift the restriction on cabs, adding: "They could reasonably include taxi access to bus lanes which would enhance the efficiency of the system and relieve congestion in surrounding streets ." The radical cab drivers group, whose rush-hour protest caused gridlock in surrounding streets, has warned that it will not back down and that demonstrations will continue indefinitely. They said they would be "back every day, same time, same place... we refuse to be destroyed by you!". Relatives and patients at University College Hospital’s Macmillan Cancer Centre were worried they would be stranded after treatment, but volunteer Taxi drivers were reported to be leaving the blockade and driving cancer patients home for free. Town Hall environment chief and avid cyclist, Adam Harrison said "the changes would improve traffic flow and air quality." Isn't that what they said about the CSH along the embankment.....and we all know how that turned out! The Labour councillor added: "Central London is afflicted by high levels of congestion and air pollution (mainly caused by Camden's unbelievably stupid traffic systems and the proliferation of empty buses) this is not a situation any of us should have to put up with any longer." Camden should consider doing something about the heavily polluting and congestion causing buses. We mustn't forget that this private bus companies are subsidised and often flood the streets with empty buses. He went on to say "Camden Council has agreed to the West End Project because of our strong belief that an urban environment doesn't have to be an unhealthy one." Funny, he never once mentioned the £37m bribe from the mayor and almost bankrupt TfL to pay for the project (allegedly, only on the terms that Taxis were excluded). Camden did carry out a consultation a few years back where residents and businesses voted that Taxis should also have access to the whole of Tottenham Court Road. More recently residents of Fitzrovia voted for the one way scheme on Tavistock Place to be returned to the previous two way system. The Town Hall added that research showed the vast majority of people using University College Hospital travelled by public transport and would not be affected by the changes (and yet the Hospital itself lobbied for a taxi rank), with bus journey times and reliability improving. -It is our belief that Camden's research is biased and flawed, as access to shops, businesses, residential properties and the Hospital will be severely restricted for vulnerable and disabled people. The scheme was introduced to coincide with the opening of a Crossrail station at Tottenham Court Road (which has now been delayed), which is hoped to be bringing thousands of extra visitors to the area. Camden haven't taken into account the type of shops on Tottenham Court Road, Habitats, Ikea and electrical outlets. Can't see too many shoppers with flat-packs, items of furniture, TVs and HiFi systems getting home on a bike or bus! Also, can't see people coming from stations and airports with luggage being dropped in Euston road and told they have to walk the rest of the way to the Grafton Hotel on foot. Developer Derwent London is building offices on the western stretch of the road. A new "pocket park" in what is now Alfred Place will close the back street to all traffic. So, that’s what this is all about, same as Chris Hayward’s building projects at the Bank Junction ...Follow the money!!!!! I travel at least 6 times a week by black cabs it’s the only way to maintain my independence but with pedestrian zones and low emission zones being enforced my independence is suffering ! This must stop &amp; we need to support the disabled community &amp; the black cab trade! It could get crazier. Uber advertises free cuddle with every journey. Participants must be drunk and female. TfL want all high streets and shopping areas buses and bikes only. They want surrounding streeets gridlocked. They way people can only get about on the bus or tube. They are £1bn in dept and it’s their only hope of raking back some income. There’s not enough profit in easing congestion. It’s imperative that we don’t let them do this to Tottenham Court road. Think Uber and TFL are working together hand and glove eventually all electric vehicles only within zones 1-2 and oyster type card will be used for these journeys with private hire the preferred transportation..as clear as night and day Black Cabs will be surplus to requirements, you need to ask the question, how much mileage is left in the Knowledge, can’t see how TFL can justify the cost/ expense of the knowledge when the numbers don’t add up how many new students per year, combined with how many NEW drivers passing out per year, combined with total expenditure of this process , examiners wages , pensions ,travel perks , backroom staff etc etc ... not sure but is this tax payers money? TFL need to decide Do they want the iconic Black Taxi being part of this country’s economic market,daily advertising this nation being the image for Tourism and providing exceptional safety to the public..if the answer is YES..STOP excluding the trade from makes this country tick from grass routes .